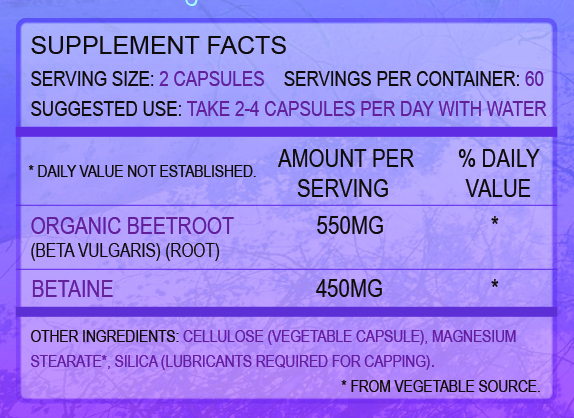 – Each serving has the betaine equivalent of 5 beetroot! – Organic, natural and pure! Betaine is a naturally occurring chemical which is found in a number of vegetables, including beetroot. Betaine is a very interesting chemical, which has attracted a lot of research in recent years. Clinical studies on betaine have shown that it is able to protect the body from cardiovascular disease by lowering the amounts of homocystine circulating in the body, and in-turn lowering blood pressure – a clear benefit for anyone in the Western world where cardiovascular disease is on the rise. In addition to protecting against cardiovascular disease, betiane is a methyl donor, which means it is needed for a number of processes in the liver and kidneys, which are responsible for neutralising and removing chemicals. Consumption of betaine can reduce fatty deposits in the liver, and improve liver health and function which reduces the risk of a number of diseases and will improve overall health. Betaine also acts as a natural osmolyte, which means it helps to regulate the hydration of cells, which is important for maintaining normal cell function, and preventing a number of health problems associated with osmotically stressed (dehydrated) cells. 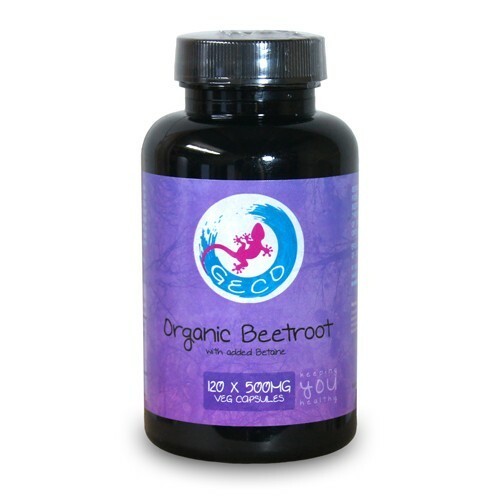 Geco’s organic beetroot supplement contains an effective 450mg of betaine per serving. This dosage has been carefully calculated to ensure you receive an effective amount of betaine so you enjoy the benefits, but are not at any risk of consuming too much betaine, even if you have a relatively high betaine diet. In addition to a clinically effective dosage of betaine, this product also contains 550mg of organic beetroot powder per serving. The purpose of this is to make this product more like a food than a supplement. By consuming betaine with nutrients it is naturally found with (such as those found in beetroot), it improves the absorption, and provides the consumer with small amounts of additional nutrients. Copyright © 2016 Geco Supplements. Health Cloud LTD. All Right Reserved.